A quick look at my post archives will reveal that we love beef in the Good Cook Doris kitchen. But with the hubby’s genetically-caused high cholesterol and a desire to incorporate more variety into our meals, we have reduced the amount of red meat we eat at home. 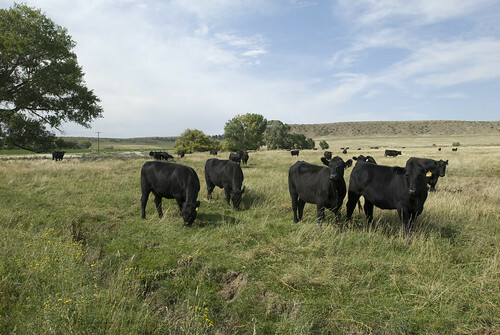 When we do buy beef we are conscious about purchasing high-quality meat. Our first preference is from the local vendors at the farmers market. That isn’t always the most convenient, so we look for grass-fed beef and/or local beef at the grocery store. Photo courtesy of Rocky Mountain Meats. I love brisket. Smoked, braised, or stewed I will eat it. It’s a cut of meat that lends itself to creativity. Over the summer I smoked the brisket on the backyard grill and enjoyed it with pickled onions. With three feet of snow on the ground and more piling on every other day (that’s what it feels like! ), we have to stick with indoor cooking for the time being. Rod sent a 2 pound grass-fed brisket for me to try. When our package first arrived, we opened the Styrofoam cooler and looked under the still-frozen solid ice packs to check out the goods. We put most of the products in the freezer, except for honey pepper beef jerky and the brisket. I can’t remember ever eating beef jerky and the hubby has never really liked jerky of any kind. But this he liked. It was because he felt confident that the ingredients were natural (not like the convenience store jerky). We gnawed on pieces of spicy sweet jerky for a few days for snacks and it was gone pretty quickly. We also tried the organic beef hotdogs for a quick weeknight dinner with coleslaw and baked beans. The hot dog ingredient list is full of recognizable items: 100% USDA Certified Organic Grass Fed Beef, Water, Organic Black Pepper, Organic White Pepper, Organic Paprika, Organic Ground Mustard, Organic Ground Celery, Organic Granulated Garlic, Sea Salt and Celery Juice Power. I can’t even tell you the last time we ate hot dogs outside of a baseball game or cookout. These were smoky and beefy and if you are craving a hot dog will do the trick. “This beef has never ever seen a feedlot, and does know what corn looks like or taste like. I believe you’re going to taste flavors that you have never had before. Understand that when the cowboys from Texas drove cattle north the cattle got fatter. The high mountain grasses of the Rocky Mountains carry a lot more protein and mineral than always green grasses of the south”. Using my grandmother’s basic brisket cooking method, I substituted my own flavors for a New England Winter Brisket. I also wanted to make barbecue sauce to top it off. With access to really great locally produced maple products this winter, I’ve been adding maple to a lot of my recipes. 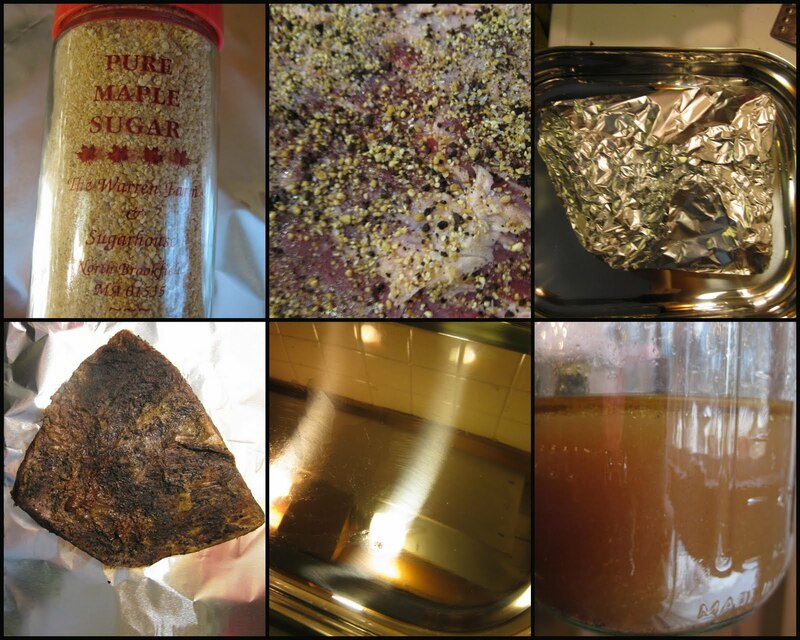 For the brisket I used granulated maple sugar, ground roast dark coffee and salt and pepper. While the brisket cooked for a few hours I made a homemade mustard-maple barbecue sauce to top it off. The sauce came out sweet & tangy and was made me think about summer (even with all the snow). So how did the brisket stack up? The brisket was 2 pounds and had a thin layer of fat on one side. I usually trim off most of the fat, leaving just a few pieces. Grass-fed beef is generally leaner than conventional beef, so it isn’t necessary to trim all the fat away. It will help baste the meat as it cooks. Regular brisket can sometimes shrink in size almost by half after cooking. I weighed the Rocky Mountain brisket before and after cooking for comparison. Since I did trim off some fat, the brisket didn’t shrink very much. It was 1/2 pound lighter after cooking. That meant more to eat! Brisket holds up well to long cooking times, but in general it’s best to cook grass-fed beef for less time than regular beef. Because it is so lean, it will dry out and overcook faster. This is best prepared the day before you want to serve. I wrote down the recipe as I went, but I know I tweaked amounts while I cooked. I’m pretty sure I added extra maple and extra mustard powder, but no record of how much. Have fun and tweak it to your liking! I served the brisket on toasted hot dog rolls with a generous serving of sauce (that's my Sunshine Soup on the side). The sauce is so delicious that I’ve been topping rice, chicken, couscous, really anything I can get my hands on with it. I hope that you enjoy! For a fun take on barbecue and the taste of summer in winter, head over to my friend’s blog at The Food in My Beard for barbecue soup! 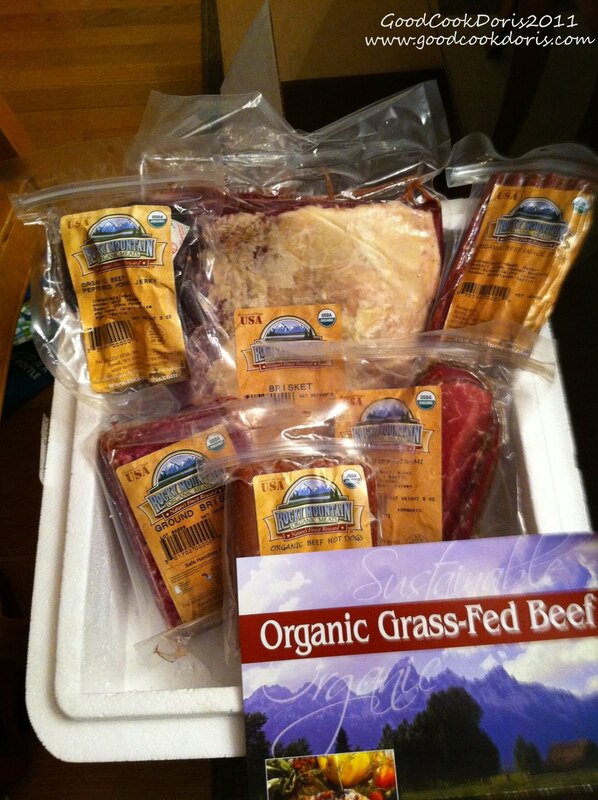 Thank you Rod and Rocky Mountain Organic Meats for sharing your delicious grass-fed beef. 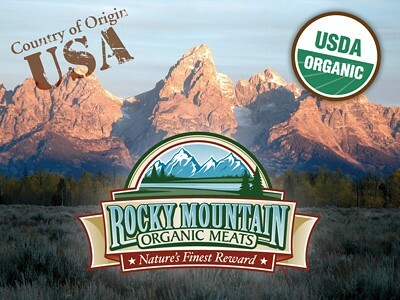 To learn more about them, visit their website at http://www.rockymtncuts.com/. Next on the list to make are burgers using the ground brisket. What's your favorite beef cut to cook? Planning is essential for fitting healthy eating into a busy schedule. Most of us eat on the go and it can be hard to resist the urge to eat unhealthy fast foods. Today’s healthy eating post is dedicated to a healthy breakfast that could also be a great lunch or late snack. You can make it on Sunday and be ready for the week. I would mix it with Frank's Red Hot - my favorite hot sauce! And I'd probably add garlic too, because I love garlic. I use it mixed with herbs as a swap for mayo on sandwiches too. Love mixing Greek yogurt and jam together...favorite snack and quick breakfast. I just recently tried it in my corn pudding recipe instead of sour cream and it was fantastic! I would love to use Chobani in place of cream when making a Thai Curry! Check the bottom of this post for another great giveaway! This week’s giveaway is from Veggie Patch for some delicious vegetarian food. Now on to this week’s creation! If you are like me, breakfast before work is an on-the-go type of meal. I eat in the car on the way to getting dropped off at the commuter rail station. With an hour commute, it isn’t reasonable to wait until I get to work to eat breakfast. Some of my regular breakfasts include low-fat waffles with almond butter, toast and peanut butter, and a microwave egg on toast. These can all be made in about 2 minutes before heading out the door. But you’ll notice something is missing from all of these – fruits and vegetables! I do try to eat a piece of fruit for a morning snack at work, but that doesn’t always happen. On Sunday I decided to come up with a new idea for this week’s healthy breakfast. It needed to be in individual serving sizes and easy to reheat before work. I decided on mini-muffin omelets and turkey bacon. For the omelets I used eggs, broccoli, and a little Monterey jack cheese. I also baked turkey bacon while the muffins were cooking. Turkey bacon has less fat and calories than regular bacon and adds additional protein to power up your morning. The turkey bacon I buy has 35 calories, 1.5 grams of fat and 6 grams of protein per slice. A fun fact about broccoli - did you know that the peak season for broccoli is in the winter? It is available year round, but its peak season is between October and April. Broccoli is also a good source of iron and vitamins A and C. The cheese adds some healthy dairy to the mix for a well-rounded breakfast! This recipe makes 12 muffins, you could easily cut it in half to make 6. For a bite sized treat you could cook the muffins in a mini-muffin pan. If broccoli isn’t your favorite, throw in any leftover vegetables like diced peppers, chopped spinach, mushrooms, or tomatoes. To keep the muffins fresh for the week wrap 1-2 muffins in plastic wrap. If you plan to eat them the next day, place them in the fridge. If not, place them in the freezer. Take out a package the night before and put them in the refrigerator to thaw overnight. To reheat, microwave for 45 seconds - 1 minute on high heat. 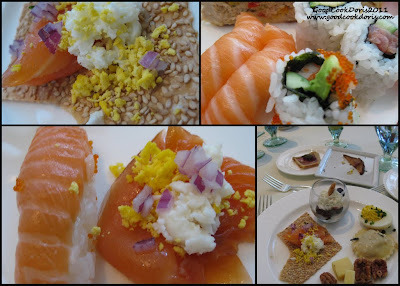 You could also pack these for a light lunch or late afternoon snack if you are working late. If you want an easy way to make these even more portable, roll up a muffin and a piece of bacon in a tortilla for a breakfast burrito or between two slices of whole wheat bread! I’ve noticed that this protein packed breakfast has kept me full until lunch this week. I throw a piece of fruit in my bag for a snack but often don’t eat it until the afternoon. I hope this inspires you to think about powering up your breakfast and starting the day right! Win 2 coupons for Veggie Patch Products! This week the lovely folks over at Veggie Patch are giving one lucky winner 2 vouchers for Veggie Patch products of their choice. Veggie Patch makes a variety of vegetarian and soy products like broccoli and cheese bites, meatless meatballs, veggie dogs and falafel (just to name a few). Required Entry: Comment below and let me know what your favorite vegetable is and how you like to eat it! Please leave a separate comment for each action below. Entries will be accepted through 9:00 p.m. EST on Tuesday, February 1, 2011. One winner will receive two vouchers for Veggie Patch products. The winner will be announced in next week’s healthy Wednesday post! For an extra chance to win, and some more great healthy snack ideas, visit Renee over at Eat.Live.Blog! Full Disclosure: Veggie Patch generously agreed to sponsor a giveaway as part of the Healthy Snack Wednesday series. Veggie Patch is responsible for fulfillment of the prize. I was not compensated for this post and do not have any personal tie-ins to the Sneak-Away contest, it just sounds like fun! Winter break is over and I've headed back to school for another semester. 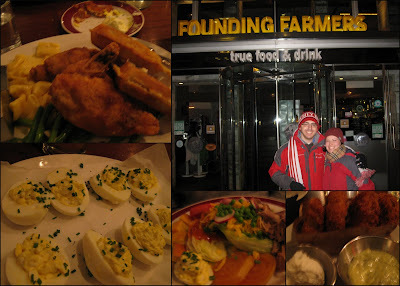 After taking a year of MBA classes, I decided to follow my passion for food (some might say obsession) and take classes in the Master of Liberal Arts (MLA) in Gastronomy program at Boston University. The Gastronomy program is not culinary school – it’s a program about the study of food – food business, marketing, culture, history, tourism, and more. 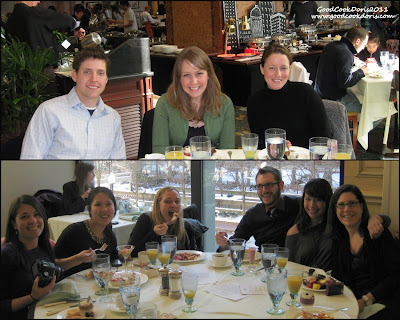 My classmates came from many different backgrounds: food enthusiasts, career switchers, professionally trained chefs, and other food industry veterans. Last semester I took an introductory course, Understanding Food: Theory and Methodology. 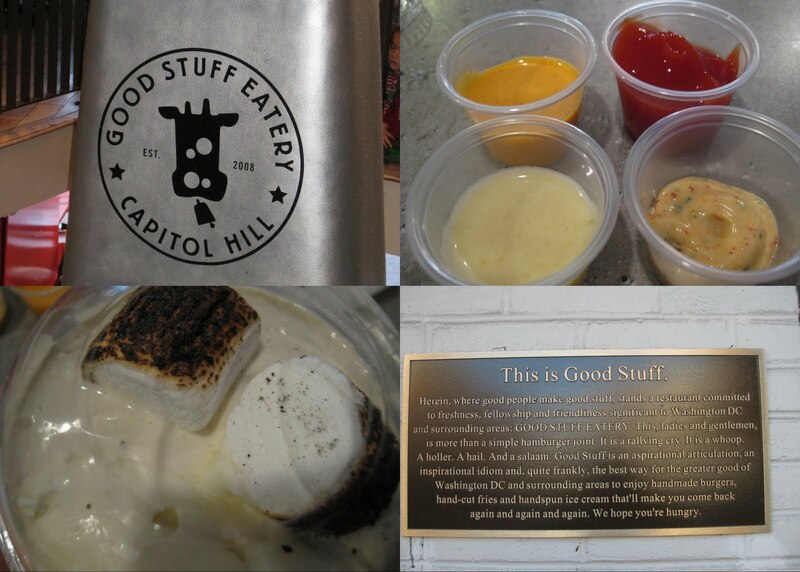 Each week we explored ‘food’ through a different liberal arts discipline. These ranged from philosophy to art history to archaeology to sociology. With a little dose of theory thrown in the curriculum helped me to understand the different lenses through which you can study the broad subject of food. Going from thinking about accounting problems to contemplating the globalization of corn was quite a switch! While it was challenging, it was a thought-provoking and enjoyable semester. How can you be unhappy when your assignments include a cookbook analysis, observing farmers markets and writing a research paper about a topic of your choosing related to food? I spent a lot of hours working on my final paper. It wasn’t perfect, but it was a great start for not having done a research paper in at least 10 years! 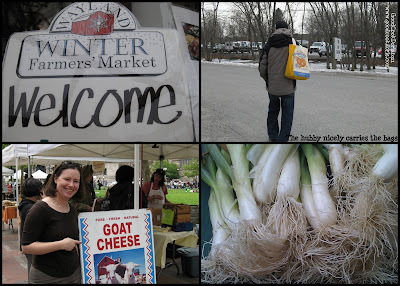 I combined what I was already doing regularly, visiting farmers markets and interviewing vendors, with some academic research for a paper discussing female food entrepreneurs and the Boston farmers market scene. I typically visit a farmers market 1-2 times per week in the summer and biweekly in the winter. 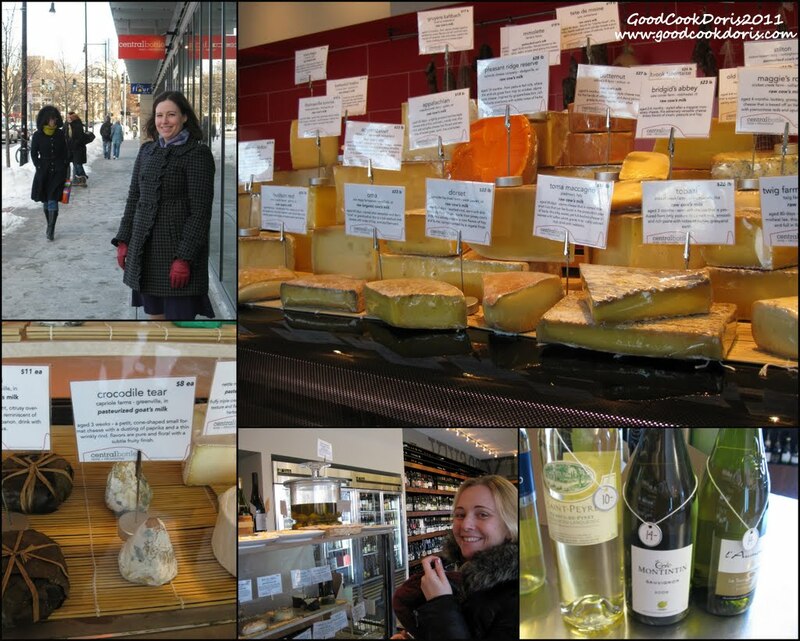 Through my observations I was intrigued that most of the non-farm food vendors were female owned and managed. I started thinking about why this was the case? Was it something about the Boston market scene? Something about the women? The nature of the food business? There were a lot of angles to consider. I reached out to a number of these women who graciously agreed to answer questions about how they got into business and their experience at Boston area farmers markets and in the food industry. I won’t bore you with all 30 pages of my paper and exhibits, but I will work on an edited version to share on the blog. This semester I am enrolled in another class, Anthropology of Food. I am fascinated by how people think about food, how it defines cultures, and its role in society. Do you ever think about how much food likes/dislikes can tell you about someone? And how people readily share this information? You wouldn’t normally tell a casual acquaintance about health issues or personal secrets, but you’ll readily share your food preferences (which can reveal a lot about you, I think!). 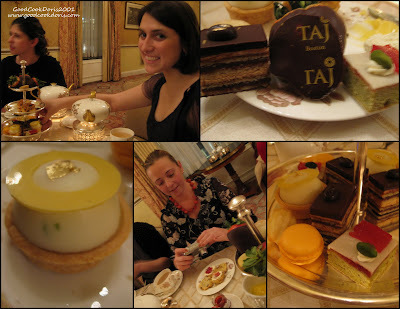 The class will look more broadly at what food can tell us about human culture and society. From food centered life history to globalization to social structures, the class will look at how anthropologists approach these topics along with the necessary methodological tools. 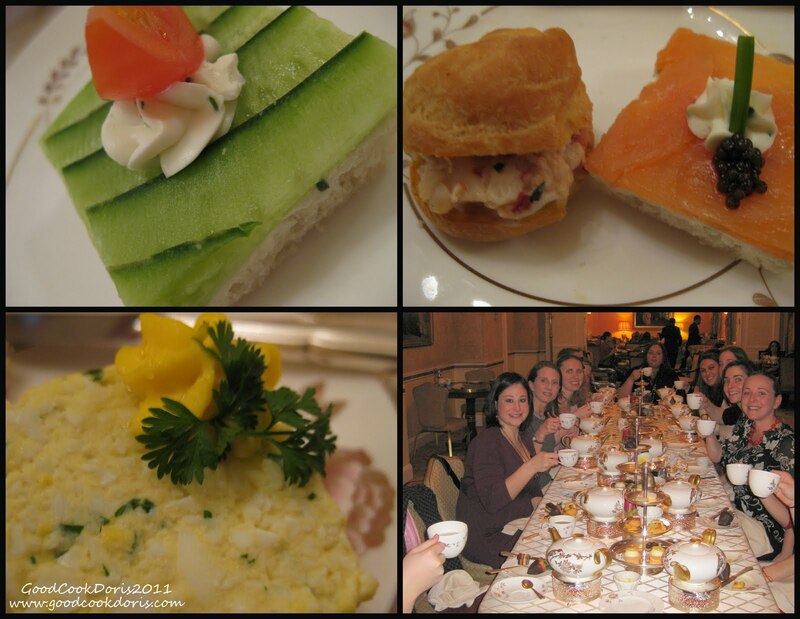 Some of the assignments include conducting an interview and writing an essay on a food centered life history, observing a food related environment and analyzing the experience, and researching, preparing, and presenting a dish based on one of the course themes for our final class. It is going to be a lot of work, but it will be engaging, challenging, and I think enjoyable! My blog posting frequency will likely decrease with the increase in homework, but I will do my best to keep to a regular schedule. I’ll try to sprinkle in learnings from my class along with regular recipes and features. Thanks for your continued support and readership. I’m looking forward to a great 2011! P.S. Don't forget to enter for a chance to win Chobani Greek Yogurt! Winners will be announced on Healthy Snack Wednesday! Enter here. This month's Daring Kitchen challenge was a dish perfect for the chilly winter temperatures. Our January 2011 Challenge comes from Jenni of The Gingered Whisk and Lisa from Parsley, Sage, Desserts and Line Drives. They have challenged the Daring Cooks to learn how to make a confit and use it within the traditional French dish of Cassoulet. They have chosen a traditional recipe from Anthony Bourdain and Michael Ruhlman. I have heard about cassoulet, but have never made it at home. After checking out the recipe provided I know why! It is full of pork, duck, and sausage. All three things that don't get cooked at our house. Thankfully our Daring Cooks hostesses provided recipes and tips for the vegetarian and non-pork eaters. However choosing a vegetarian version eliminates duck confit from the dish a technique that our hostesses wanted us to learn. They also included recipes for leek and garlic confit to incorporate into the dish. The vegetarian cassoulet recipe came from Gourmet Magazine, March 2008. Glancing at the recipe it seemed pretty straightforward. The meat version preparation can stretch over four days and I didn't want to feel left out. 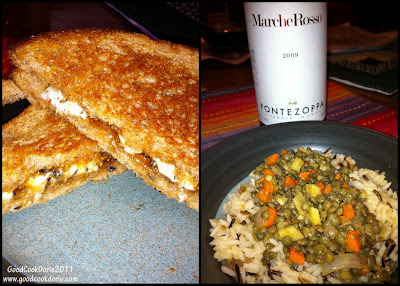 I added extra steps to my vegetarian version to complete over three days of cooking. First, I baked baguettes to be turned into the garlic breadcrumb topping. I made this King Arthur Flour baguette recipe for the June Daring Cooks Challenge (pate and freshly baked bread). 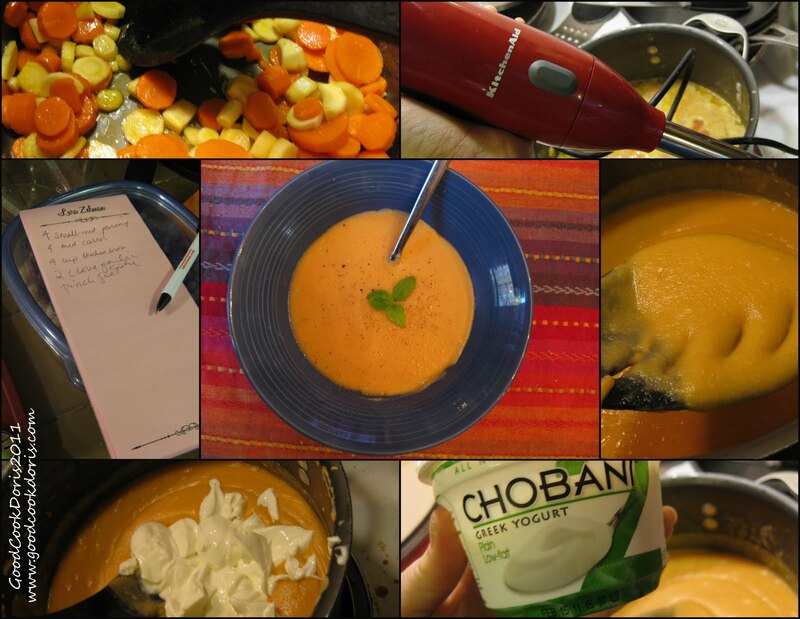 The recipe is easy to follow and the results are great! I also decided to buy dried beans in place of the canned beans the recipe called for. The recipe lists 3 19-ounce cans of white beans. In my head, I thought, "Okay, 3x19= 57 ounces". I loaded up on dried navy beans in the bulk aisle and brought my beans home to soak. About 3 hours into soaking, the beans were starting to expand out of their bowl. I split them up into a few containers and let them to continue to soak. About 12 hours in, I realized that I was soaking 3 times as many beans as I really needed. Oops! That's why last week's healthy snack ingredient was white beans. I parboiled the beans before using them in the cassoulet according to advice on the Rancho Gordo beans site. The other component I made in advance was the garlic confit. The hostesses provided a recipe from Saveur. The most difficult part was peeling the garlic. I could have done the whack and peel, but I felt like the cloves should be whole for this dish. The picture didn't come out very good, but the garlic and remaining garlic oil were amazing. The recipe made enough garlic to spread on toast and oil to use in my white bean dip. The last premade ingredient for the cassoulet was homemade turkey stock. I simmered leftover turkey bones with vegetables and herbs for a rich and flavorful stock. The stock was a great swap for the water that was called for in the cassoulet recipe. On cassoulet cooking day I assembled my prepared ingredients and chopped carrots and leeks. The first step was cooking down the vegetables and fresh parsley. 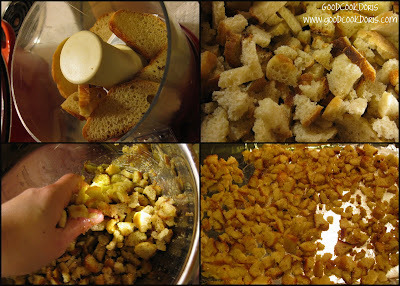 While the cassoulet cooked I toasted thin slices of the baguette for the breadcrumbs. The slices dried out in a 200 degree oven for about a half an hour. They were so crunchy that the food processor blades couldn't chop them. I crumbled them by hand and added a few cloves and some oil from the garlic confit. They went back into the oven to toast for an additional 15 minutes before getting tossed with fresh parsley. These were unbelievably good. I can't wait to make them again for salad, soups, or just a snack. With everything cooked and prepared it was time to eat. This cassoulet was amazing. It was rich, hearty and tasted better each day. We had enough for lunches and dinners for an entire week. Thanks to the Daring Cooks for a fun and delicious challenge! Did you enter to win prizes from Pretzel Crisps and Tribe Hummus yet? You have until Tuesday! We made it through week one of our biggest loser style challenge! Renee and I didn't have a 'big number' on the scale at our second weigh-in, but we did have a successful first week. We stopped taking the elevator and walked up four flights of stairs instead. Lunch hour included healthy dishes and a 20 minute walk each day. It's an 8-week challenge so what really counts is the long-term result. Being at Boston University, there are a lot of resources available to faculty and staff. One great resource is access to the BU Nutrition and Fitness Center. They work hard to make healthy choices available on campus and to educate the University about healthier living. One of their nutritionists came to give us a brief talk about healthy eating last week. Inspired by their talk and some recipes they sent over, Renee and I decided to choose oats as our ingredient for this week's healthy snack. For Healthy Snack Wednesday, I decided to try one of the oatmeal cookie recipes sent over from the women at Sargent Choice (at BU Nutrition and Fitness). They are not no-calorie and no-fat cookies, but they are more nutritious and less-bad for you. Unless of course you eat all 3-dozen at once! The key to healthy eating is really moderation. I find that I don't have to give up my favorite foods, I just need to eat the appropriate portion size. These cookies have heart-healthy oats and flax seed. 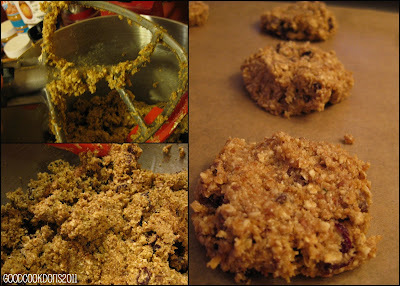 Flax seed adds a good dose of nutritional value to the cookies with omega-3 (good fat) and additional fiber. I did add a little extra antioxidants to the original recipe with a few mini-dark chocolate chips. Using mini-chips gives you a little chocolate flavor in each cookie without adding too much additional sugar. If you make 1 tablespoon sized cookies this recipe will yield 3-dozen heart healthy cookies to share with your family, friends, or co-workers. Thanks again to Sargent Choice for the recipe and nutrition information. Please note, the nutrition information does not account for the mini-chocolate chips. I also swapped dried cherries for the raisins which might change the sugar content as well. How is your healthy snacking and eating going? Any tips or tricks that you use to be successful? Now for some healthy snacking fun! Tribe Hummus and Pretzel Crisps have generously offered to giveaway healthy snacks to some lucky readers. Winners will be chosen at random using random.org. One winner will win a case (12 packs) of Pretzel Crisps in the flavor(s) of their choice. 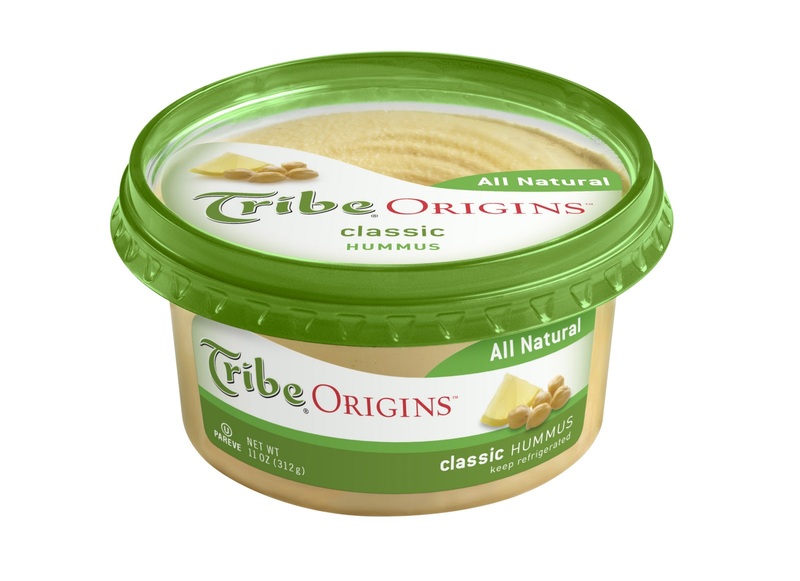 Three additional winners will win 2 vouchers for their choice of Tribe Origins Hummus. Entries due by midnight on Tuesday, January 18. Winners will be announced on Wednesday, January 19, 2011. Entry 1: Visit both of these snacks’ websites, and comment below on which flavor Pretzel Crisps and which flavor Tribe Origins Hummus you would like to try. Entry 2: Become a fan of Pretzel Crisps and Tribe Hummus on Facebook, and leave me a comment below. Bonus entry: Leave a comment letting me know if you subscribe to the blog. If you would like to add the blog to your reader or subscribe, leave a note letting me know you did! Full disclosure: Tribe Hummus and Pretzel Crisps are responsible for fulfillment of the contest prizes. I was not compensated for promoting this contest, except for a sample of crisps and hummus delivered by Pretzel Crisps (see last Wednesday's post for details).